What does everyone in the modern world need to know? Renowned psychologist Jordan B. Peterson's answer to this most difficult of questions uniquely combines the hard-won truths of ancient tradition with the stunning revelations of cutting-edge scientific research.Humorous, surprising and informative, Dr. Peterson tells us why skateboarding boys and girls must be left alone, what terrible fate awaits those who criticize too easily, and why you should always pet a cat when you meet one on the street. What does the nervous system of the lowly lobster have to tell us about standing up straight (with our shoulders back) and about success in life? Why did ancient Egyptians worship the capacity to pay careful attention as the highest of gods? What dreadful paths do people tread when they become resentful, arrogant and vengeful? 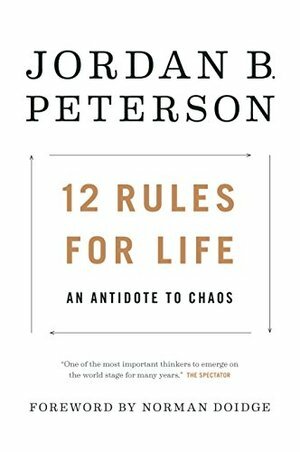 Dr. Peterson journeys broadly, discussing discipline, freedom, adventure and responsibility, distilling the world's wisdom into 12 practical and profound rules for life. 12 Rules for Life shatters the modern commonplaces of science, faith and human nature, while transforming and ennobling the mind and spirit of its readers. It's good to see a "self-help" book with some meat to chew on. Jordan B Peterson is a controversial figure so you won't necessarily agree with everything he says in this book. But it will make you think which is what a good book should do. At the heart of the 12 rules is the belief that suffering is a part of life and we need to choose to face it or run in the opposite direction. Running in the opposite direction away from suffering is, according to Peterson, a denial of life itself. So, obviously, Peterson believes we need to choose to face it. His 12 rules are intended to help us do that. Peterson is smart, very well versed in many issues but, in truth, he is an alt-right sweetened for the mainstream. I like some of his ideas but, in general, it is only fuel to the right wing, with some preacher prose.